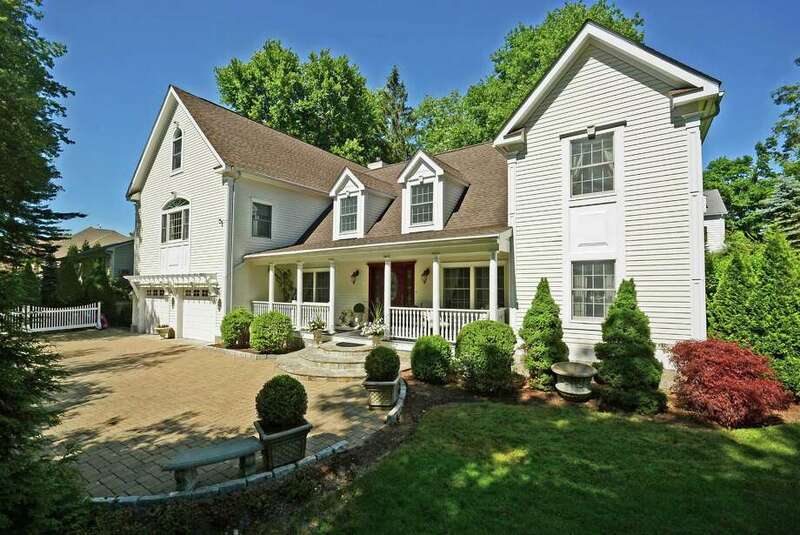 The renovated Colonial at 228 Old Stamford Road in New Canaan, a short walk to town, has nine rooms. It is on the market for $1,575,000. A short stroll to town, the renovated and expanded Colonial at 228 Old Stamford Road in New Canaan is a perfect home for the suburban family. A brick drive lined with a picket fence and Belgian blocks welcomes visitors to the nearly 5,000-square-foot home. "This is a thoughtfully renovated and expanded classic New England Colonial ideal for in-town living," said Kendall Sneddon, a real estate agent with Halstead Property. The covered porch features a bead-board ceiling and offers plenty of space for rocking chairs and even the quintessential swing. Inside, the home is spacious and elegant, with traditional center-hall flow. A formal living room is on the left and a formal dining room on the right, both featuring columns and crown molding. The dining room has a dry bar with both shelving for stemware and drawers for storing linens and silverware. The large eat-in kitchen has granite counters and stainless steel appliances, as well as a large center island offering shelving for storing cookbooks. The attached breakfast room has a cathedral ceiling and sliding doors that lead to the private stone terrace, which is surrounded by evergreen screening. A powder room of the kitchen features a pedestal sink with a decorative wrought-iron base with matching wall sconces. Also off the kitchen is a large walk-in pantry and includes the plumbing for a second laundry room. The sunken family room, featuring a 9.5-foot ceiling, is made sunny by four large windows and French doors leading to the large outdoor patio -- a great spot for entertaining. The family room has a large stone fireplace with a mahogany mantel, wide crown molding and recessed lighting. The second floor opens to a large landing with a sitting nook that could be used for homework or play. The large master bedroom has a Palladian window overlooking the front of the property. The elegant master bathroom features a claw-foot tub with a brass hand shower under a crystal chandelier. A double mahogany vanity and a steam shower both have brass fixtures. A former fifth bedroom was transformed into a master dressing and laundry room combination with endless storage. There are two additional bedrooms on the second floor with full baths. The third floor also has a fully carpeted bonus room, which could be used as an in-law suite or playroom. It features built-in shelving, a cathedral ceiling, a kitchenette and a full bath. For more information or to make an appointment to see the house, contact Kendall Sneddon of Halstead Property at 203-219-3769 or jsneddon@halstead.com.